Sibling rivalry is initiated when a boy's family adopts a brother for him in this fanciful and imaginative story. I love the opening line, "The day Mom and Dad went to pick up my new brother, I built a raft." Our hero sets sail for Bongodongo and then other ports as he tries to distance himself from this new brother he obviously resents. Tim Wynne-Jones doesn't disappoint as the younger brother hangs about trying to establish a friendship with his new older brother. 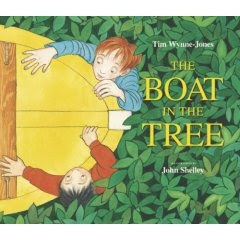 The Boat in the Tree was one of the books entered for the Cybils awards this year and is still one of my favorites. Although the story is quite good, what really makes the book sing are the illustrations by John Shelley. As the boy dreams of ships that will carry him away from the new brother, Shelley skillfully captures the breadth of the ship-crazy boy's imagination complete with a pirate's island and smoking volcano. He also details the day-to-day world the boys actually live in. When a storm sends a boat into a tree and Simon helps his older brother bring it down , it is enough to bridge the gap between the boys and between the real and the imagined. There is so much detail in the illustrations that young children ages 3-6 will be entertained for hours. I recommend this book.